When Pope Benedict announced his resignation just over a week ago, the world was taken by surprise. But Benedict's decision was one he evidently has been ruminating over for quite some time. Not only has he suggested in the past that a pope no longer able to fulfill his duties might be "obligated" to resign; he also seemed to closely identify with a predecessor from the 13th century, Pope Celestine V, who resigned after a short, difficult reign in 1294, saying, "We, Celestine, Pope V, moved by legitimate reasons, that is to say for the sake of humility... do freely and voluntarily resign the pontificate". Visiting the relics of Celestine for the second time in 2010, Benedict serenely laid his stole over the relics, and left it there. Almost three years later, he stunned the world by humbly stating: "I have had to recognize my incapacity to adequately fulfill the ministry entrusted to me. For this reason, and well aware of the seriousness of the act, with full freedom I declare that I renounce the ministry of Bishop of Rome, Successor of Saint Peter." In a world that views the papacy as other-worldly, Pope Benedict's decision can seem perplexing. But his move reminds us all of something he knows well: the pope is a man with a special ministry, and what is important is the ministry, not the man. His decision is a humble and brave one, and his wisdom is evident. Let us pray that his precedent will be a comforting and helpful one to future popes, and that Pope Benedict's retirement will be peaceful and prayerful. We at CatholicTV are lifting Pope Benedict up in prayer as he works through the remaining weeks of his papacy. We profoundly respect the humility of his decision, and our love and prayers are with him. CatholicTV covered the Boston Catholic Press Conference on Tuesday, and we aired it that night. We'll be airing interviews from the event in the coming weeks, and devoting some of our programming to the ministry of Pope Benedict as we prepare to cover conclave in March. Stay updated on our coverage of the transition over the next few weeks by checking in with us on Twitter and Facebook. First of all, I would like to thank all of you for a successful 2013 Telethon. We went above and beyond last year, and it's all because of you. Because of your generous pledges, we are able to keep bringing the Daily Mass and our other great programs to you. But the Telethon is only one fundraiser, and we run all year. In addition to the wonderful boost we get from Telethon pledges, we rely on regular, monthly support from you, the parishioners of the airwaves. Today I would like to tell you about a chart you will see inside the February monthly magazine. This chart reflects the amount of donation envelopes we receive each month from the viewers of CatholicTV and readers of the magazine. We need your help. Last month we mailed out over 16,000 magazines, and more than 1,200 donations were returned to us using the envelopes inside the magazines. Father Reed and I would like to get that number up. You could see the tension leave Father Franks face. He smiled and did not need to say another word. That was almost 20 years ago. It is not easy to ask a friend for help but today we turn to you. Please continue your support of us, and consider increasing it if you are able. If you cannot afford to make a gift please say a prayer for our ministry. And for those of you who don't receive a monthly magazine, consider helping us out online. You are our rock on which we stand. Because of you and many like you we continue to grow and expand, bringing the saving message of Jesus to a world that needs it. With your gifts at the Telethon and your continued gifts throughout the year, CatholicTV is able to touch many lives with our programming. Father Reed, myself and the entire hard working staff thank you for that. Today we remember the deaths of Saint Paul Miki and his 25 companions, who were crucified on a hill top overlooking Nagasaki, Japan. 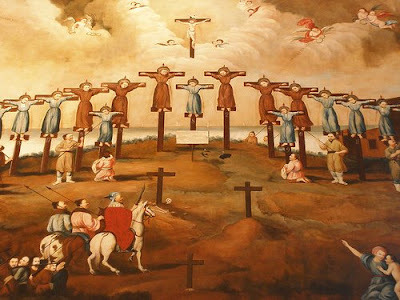 Persecuted for their persistent Catholic faith, the 26 martyrs were forced to march 600 miles before they were publicly executed in the 16th century. Martyrdom almost seems foolish, doesn't it? It probably would have been pretty easy to deny your faith-- a forgivable offense in the face of death, for sure. So why be so foolish? In 1 Corinthians 4:10, Paul calls himself a "fool on Christ's account". In the early Christian Church, being a "fool for Christ", or being "foolish for Christ's sake", was a Christian ideal. The imitation of Christ's meekness which led to poverty, mockery, and even death, was seen as foolish to the rest of the world. Why give up all your possessions? Why accept death rather than tell the persecuters what they wanted to hear? As Paul tells us in 1 Corinthians 1:18, "The message of the cross is foolishness to those who are perishing, but to us who are being saved it is the power of God." While Christians continue to be martyred in several parts of the world, for many of us martyrdom is not something truly comprehensible. While we may boast that we would easily accept martyrdom, it's hard to know if we actually would unless we were faced with it. Most of us can't fathom what Saint Paul Miki, his companions, and all the other martyrs underwent because of their faith. But perhaps there are other ways we can be foolish for Christ's sake. Jesus allowed himself to look ridiculous. He allowed his teachings to be mocked, he allowed himself to be publicly displayed and humiliated by all in attendence. He was laughed at and sneered at. Most of us are concerned with coming across as cool or acceptable. Though we profess faith in Christ, we still worry about what other people think of us. Today, take a moment to reflect on how willing you are to be a fool for Christ, or to start simply, a fool in general. Especially as we move into Lent next week, it's a great time to think about something we have or do that we are particularly proud of, and how giving it up may make us look foolish or passe. Perhaps taking on this foolishness could be a good Lenten sacrifice. When desperate, I will readily pray for help! I guess that’s only human. For example, I will pray to find just about anything I've lost, especially if it's car keys or some other essential thing to daily life. Of course, I pray continuously for those of you who are struggling with health or family. But I accuse myself of often forgetting to pray for inspiration or strength in the middle of just a regular day. This is one lesson that St Thérèse of Lisieux, a Doctor of the Church, still teaches. That the all-powerful God is interested in every detail of our lives….every detail, for every one of us. But Thérèse has an even deeper lesson for us. She teaches us that all those things in our lives which are weak, all the failures--the things that we would like to cover over and to hide away--these are the things that God is drawn to the most! The little way of St Thérèse demonstrates for us that our weakness, our littleness, is the very stuff of salvation. In our Christian Faith there is a basic mistake that we can make and that is to make our religion about what we do for God. We keep the commandments, we go to Mass; we say our prayers, we fast, we give money to charity. We have to do these things. But our Faith is not first what we do, it is rather about what God does for us. God has given us this great saint, the Patroness of CatholicTV, to teach us about something in which we think we are experts: love, which is the essence of God. When Blessed Pope John II made her a Doctor, a teacher, of the Church he said that she taught us the ‘science of love’. And that is: God has loved us first. We can know that love, experience it, live in it. But we cannot earn it, merit it - we can only receive it as a free gift. Sister Thérèse, continues to be love for us. This patroness of missionaries and, of course of The CatholicTV Network, she is a true friend to all who look to her for intercession.